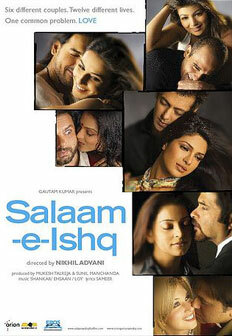 An intricate romantic drama, written and directed by Nikil Advani. Produced by Mukesh Talreja, Sunil Manchanda. I played Ashutosh Raina, a television editor. The film weaves a number of love stories together. In one, Ashutosh, a Hindu, has married a Muslim colleague, Tehzeeb Hussain, against his father's wishes. When she is badly injured in a train crash, Tehzeeb loses all memory of Ashutosh. Devastated, he attempts to rekindle their love in her heart. "I liked 'Salaam-e-Ishq' and I liked the story I was offered. Vidya Balan is damn sweet and ours was a nice, different pairing. Vidya and I have a great on-screen chemistry because we share the same interests. I often hear that people would like to see us in a film together again."